There’s an oft-cited claim that half of all marriages end in divorce. That’s not strictly true. The divorce rate peaked at over 45% in the 1980s but has been falling ever since. No matter what the statistics say, divorce is still difficult for the whole family. It’s especially hard for the children. You know what life was like before your partner and can probably imagine life without them. Your children don’t have that benefit of experience. 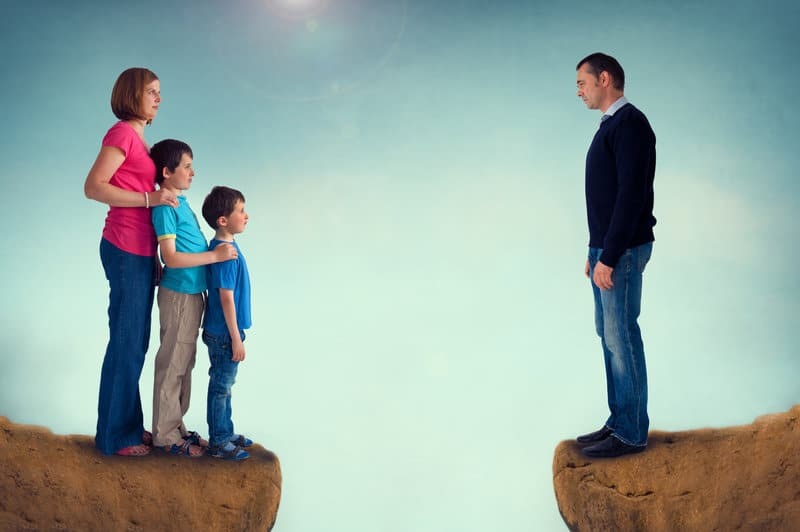 Even joint custody poses problems due to the change and upheaval it entails. Financially planning for a divorce is one thing. Emotionally preparing your children is another. This guide will help you to plan how you will discuss the situation with your family. Telling your children that you’re getting divorced is a difficult conversation. You don’t want to make things worse by the discussion turning into an argument. Before you talk to them, set ground rules with your partner. Work out how you’re going to break the news and agree what you’ll say. You need to avoid assigning blame and you don’t want the children to feel pressured into choosing sides. It’s best to block out time for the conversation so it doesn’t feel rushed. Have a plan for care arrangements in place before you have the discussion. That will help you answer the question ‘What will happen to me/us?’ It’ll show your children that you’re still putting their needs first. The children need time to process the news and ask questions. Let them express themselves, even if they get angry or upset with you. It’s best if you can have the discussion together. This will reinforce for the children that you’re still capable of a ‘united front’. It’ll show them you can still talk to one another and you’re both there for them. Try reading our guide to an amicable divorce if you want to relieve some of the stress. If being in the same room as your partner is too difficult, ask a neutral third party to be present. Or have two conversations and agree on a set script. Planning on joint custody means putting in a joint effort. You’re an adult so you process information in a different way to your children. You know what divorce means and how it can affect your life. But they don’t. They may be scared they won’t see one of you again, even if you’re working on joint custody. They may even blame themselves for the split. Work out how you’ll reassure them that it’s not their fault. Try to use their language to help them see that both of you still love them, even if you can’t work things out with each other. Keeping things simple and factual helps you to avoid toxic conversations or passive aggression. Children will pick up on these cues. At worst, if they think you’re angry or upset, then they should be angry or upset. A calm and straightforward approach is best. Maintaining a routine is a good way to help them process the news. If they see that core parts of their life won’t change, they’ll be better equipped to deal with the upheaval. Take it in turns to take them to school, keep up with their after-school activities, and so on. Inform the teachers at their school that you’ll be sharing joint custody. It’ll help staff monitor their behavior and notify you if they act out or become withdrawn. It’s advisable to tell the teachers the day before you tell your children. That helps the teaching staff to prepare for potential problems. If necessary, let the parents of their friends know. That’s important if you normally pick them up from play dates, and your partner will now be sharing the responsibility. Once you establish separate households, continue following their routine. It can be tempting to allow your children more free rein so they see you as ‘the fun parent’. Don’t fall for it. You and your partner need to maintain consistency. If you continue to set the same rules, it’ll reinforce for your child that not much has changed. This will help your child feel more secure. The children also need to feel they’re still allowed to love both of you without being disloyal to one parent. Divorce doesn’t fall out of thin air. Your children will have noticed the tension between you. They may have heard you fighting. Your discussion is the perfect place to reassure them that divorce actually means less fighting. If you’re lucky, you and your partner can still work as friends, if not as a couple. Divorce may be the end of you as a couple but your children need to see it’s just the next chapter in your life as a family. Joint custody means you’ll still be a family – just in a different way. Studies show that children in a joint custody arrangement fare better than those in other arrangements. Your children will benefit from your shared decision-making and responsibilities – just as if you were still together. If necessary, let them talk to their friends if they come from a divorced family. Their friends will be able to come up with positives that your children will understand. One of you will leave the family home. If you haven’t already done so, then you can ask your children if they’d like to help you choose a new home. After all, they’ll be spending half of their time there too. It’ll help them to feel like they’re still part of the family. They’ll also feel like you still respect their input. If they’re not interested, don’t force the issue. But try to choose somewhere that will be a safe place for them too. We’ve discussed how you can be there for your child. But you need someone to be there for you too. Being prepared and armed with solid advice is the best way to answer their questions and feel secure in yourself. Contact us if you need divorce advice. We want to make the painful process as smooth as possible. This entry was posted in Custody, Divorce, Family Law on September 6, 2017 by admin.